What are Fluoroscopic Guided Hip Injections? Fluoroscopic guided hip injections are an outpatient procedure performed to help relieve symptoms of hip arthritis, a painful inflammatory condition in the hip. Injections, a nonsurgical procedure, relieve symptoms by accurately delivering anti-inflammatory and numbing medication into the hip joint. Who needs Fluoroscopic Guided Hip Injections? This procedure is often performed as a conservative treatment method for patients with arthritis of the hip. 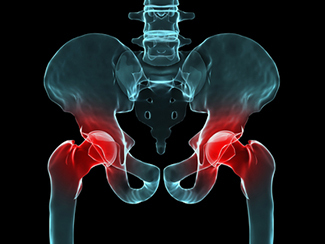 Hip arthritis is an inflammatory condition of the hip that can cause pain and mobility issues. The numbing medication in the injection will relieve pain temporarily while the anti-inflammatory medication will help with long term relief. What are the steps in Fluoroscopic Guided Hip Injections? The site of injection at the front of the hip is cleaned and prepped. The doctor then injects an anesthetic to numb the injection site. A fluoroscope is placed over the hip to provide image guidance during the procedure. The physician injects dye into the hip joint. This dye can be seen in the images provided by the fluoroscope, which the doctor uses to determine if the needle is correctly placed or if it needs to be repositioned. Once the needle is correctly positioned, the doctor is prepared to inject the anti-inflammatory and numbing medication. The syringe attached to the needle is changed from one with dye to one with medication. The medication is then injected into the hip joint. Once the injection is complete, the doctor removes the needle. A bandage is applied to the injection site. This outpatient procedure is nonsurgical, so the patient may only be monitored for a short time after the injection. After that, the patient is able to return home.